Aida and Mahmoud are a dynamic sister-brother producer team. 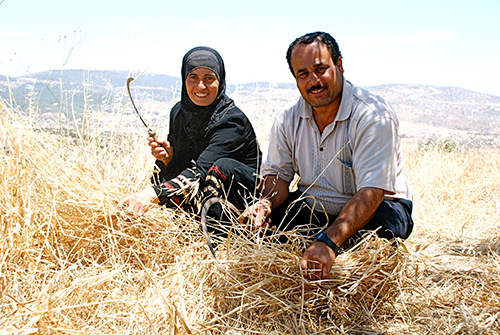 They inherited their land from their parents and have been carrying on the Palestinian traditions of planting and harvesting while at the same time adopting new methods of organic agriculture to improve their soil and their environment. The Karam’s hope that their children will continue their agricultural tradition, but fear that modern day demands will force them to seek work in different areas. However, Mahmoud’s daughter, Hanin, is glad Canaan exists because she knows that next year she can apply for the Canaan University Scholarship Program so that she can pursue her dream of going to art school in Nablus. She is confident that whatever she will end up doing in the future will involve her village, its landscape, and its people.